Cogstone workers place ancient elephant bone in plaster cast to safely remove it from the subway excavation. The camel bone measures approximately 20 inches. 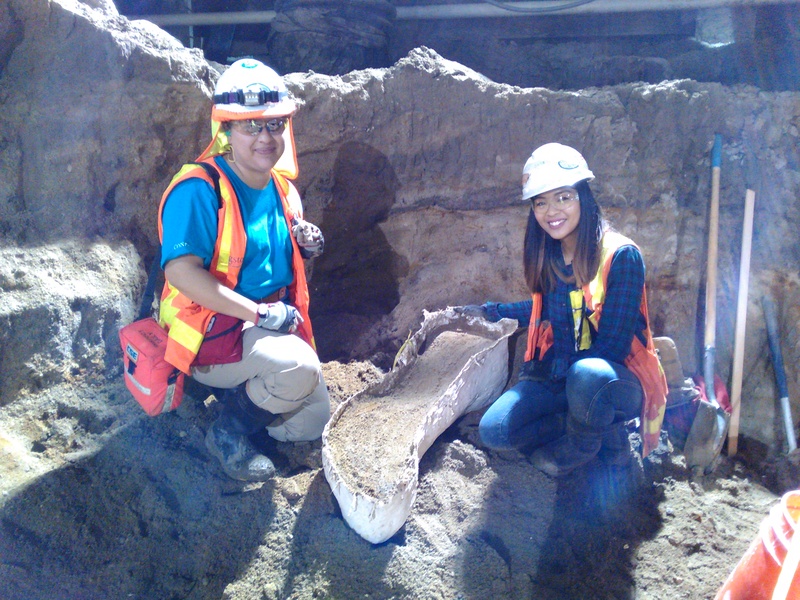 Metro Purple Line Extension workers excavating the future subway station at Wilshire and La Brea Avenue in L.A.’s Miracle Mile District have unearthed the station’s second Ice Age fossils: a camel bone and a mammoth or mastodon bone. Fossils were uncovered April 12 and 13 as Metro’s contractor Skanska, Traylor, Shea was digging the subway station box. Cogstone Resource Management, the project’s paleontologist, was monitoring excavation work and temporarily diverted the digging operation to carefully preserve and extract the fossils using plaster casts. Cogstone paleontologists then transported the fossils to the company’s lab in Riverside, California, where they were formally identified. The first fossil is a radioulna – a combination of forearm bones between the wrist and elbow – and is from an extinct camel named Camelops hesternus. These bones gave the ancient camel added support to displace its body weight over its front and hind legs. The Pleistocene era fossil is approximately 20 inches long. The Ice Age camel fossil is slightly different than modern dromedary camels. Camelops hesternus had longer limbs, knobbier knees and a larger head. Little known fact: Camels originated in North America about 45 million years ago. The second fossil is most likely a femur, or thigh bone, of an Ice Age elephant. Referred to as a proboscidean, this elephant fossil comes from either a mastodon or mammoth. These types of early elephants were the largest of the land mammals during the Ice Age. If a mammoth, it would be a Columbian mammoth — not a wooly mammoth. The L.A. area would have been too warm to support wooly mammoths. The bone itself is a major weight-bearing bone, is very robust and measures approximately 36 inches in length. Ancient camels, mastodons and mammoths went extinct in North America at least 10,000 years ago during a wave of large animal extinctions following the last Ice Age. Both new fossils are the second ancient animals discovered by the Metro Purple Line Subway Extension Project. Metro’s contractor is now building a four-mile subway extension from the Wilshire/Western Purple Line terminus to Wilshire/La Cienega in Beverly Hills. A tusk, tooth fragments and a nearly complete skull from a mastodon were unearthed at the same Wilshire/La Brea Station excavation site last November. All fossils found at the Wilshire/La Brea station excavation will be handed over to the Natural History Museum of Los Angeles County. For additional project information, please visit www.metro.net/purplelineext. It would be great to see these fossils displayed behind a glass wall at the Purple Line station. It would be neat to have them incorporated into a station as artwork, like an exhibition at LACMA. Cool. I wonder if they’ll find more fossils when digging the Fairfax station. Kind of ironic how they had to transport the fossils all the way to Riverside, what with the Page Museum being just a few blocks away.